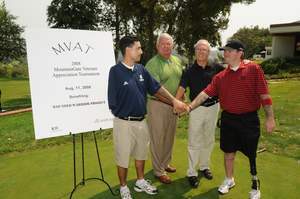 WHAT: Wounded Warrior Project Golf Tournament, sponsored by the MountainGate Country Club to benefit the severely wounded veterans of the Iraq and Afghanistan wars. Several of these vets will be playing despite their prosthetics -- an inspiring example of grit and courage. Tournament goal is to exceed the $80,000 raised in 2007.
WHO: Guest of Honor: Michael Thornton, whose heroic act as a Navy SEAL won him the Congressional Medal of Honor. Mistress of Ceremonies: "JAG" star Karri Turner. VISUALS: Dramatic opening ceremony will be marked by a color guard and competing wounded warriors escorted to their carts by MOH recipient Michael Thornton as more than 210 golfers salute them and Steve Amerson sings the national anthem. At the dinner ceremonies, there will be a five-plane flyover. Also candid shots of wounded warriors playing will be permitted. INTERVIEWS FROM: 9:45-10:45. Tournament starts 11 a.m. sharp. A press reception area will be set up at the main entry to the clubhouse. WHERE: MountainGate Country Club -- 405 Freeway to Getty Drive, then north to MoutainGate Drive, the stop light after Bel Air Crest, north of Getty Center. Turn left and follow signs to parking lot. Check in with receptionist and she will assist you. For more information on Wounded Warrior Project, please visit www.woundedwarriorproject.org. Supporting the MountainGate Veterans Appreciation Golf and Tennis Tournament Aug. 11 to raise funds for the Wounded Warrior Project, which looks after seriously wounded veterans of the Iraq and Afghanistan wars, are (from left) Norbie Laro, Congressional Medal of Honor winner Michael Thornton, Elliot Dix, tournament chair, and David Foss. Wounded veterans Laro and Foss will play in the tournament.